Check out the photos from the ground breaking ceremony below. Site prep for Summer 2019 will start soon! Save on DIA Parking and Support the Park! Save these Fine Airport Parking Coupons today! At the end of 2017, Patti Bateman and Linda Witulski began to talk about the Aurora Rotary Foundation about how our club could help the Aurora Community. It was clear that an inclusive park for students with disabilities would be something the Aurora Community could use for its children. Our dream was to make this a park where all students could play together, side by side. There are very few places a disabled child can play with friends and other children in a safe environment in the Denver Metro Area. 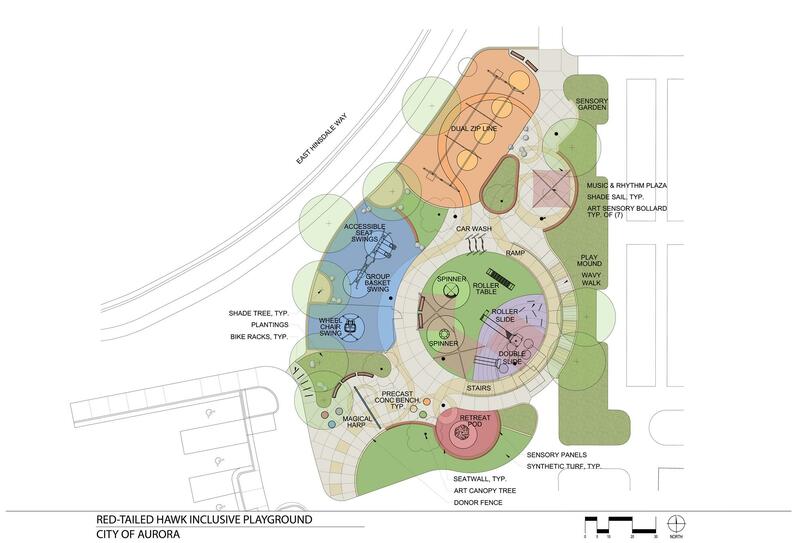 We asked club member Rick Richard to join us, and together we approached the City of Aurora’s Parks, Recreation and Open Space (PROS) Department to see if they might have space in one of Aurora ‘s parks where we might add an inclusive play area. 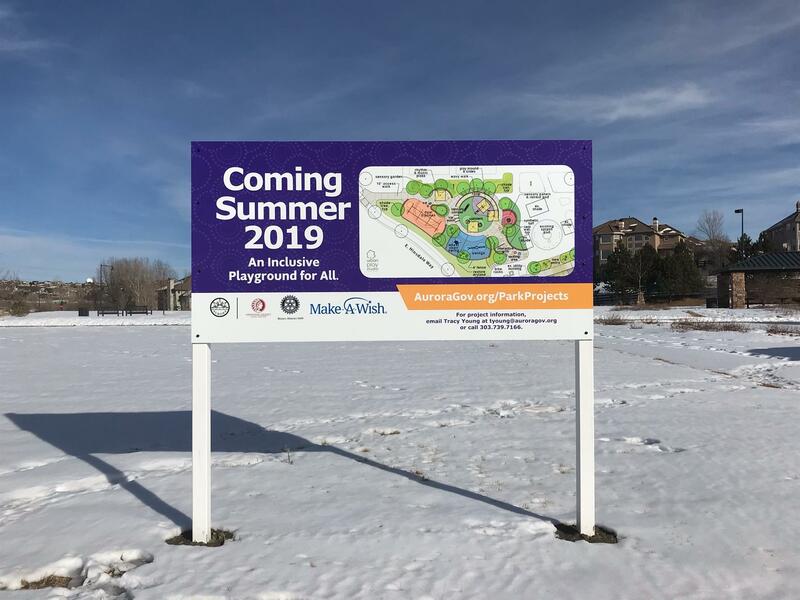 We met with several people at the City of Aurora and found out a local family had recently approached the city as they had a son, Ashaun, who was in a wheelchair and wondered if an inclusive playground could be built in Aurora for their son. They had also contacted the Make a Wish Foundation, and together they approached the City of Aurora. The City of Aurora, with our Club’s commitment and pledge of funds, applied for an Open Space grant with Arapahoe County. In August 2018 we were awarded the grant. From birth to almost age two, Ashaun was a healthy child and was meeting all his developmental milestones. Shortly before his second birthday, his biological grandfather shook and beat Ashaun nearly to death. Ashaun was not expected to survive. After nearly two months in Children’s Hospital, Ashaun was placed in our home in foster care. We were asked to comfort him until he passed. Well, Ashaun has beaten the odds! He is now a seven-year-old little boy filled with joy and lots of smiles. However, the child abuse Ashaun suffered has left him unable to walk, talk or eat. He now requires being fed through a tube in his intestine. He has had numerous hospitalizations and last year had to have his entire colon removed so now also has an ileostomy. He is legally blind and physically functions similarly to that of a very young infant. Mentally, he understands just about everything. He loves silly jokes, music, anticipation games, his friends and above all else, going super-fast in his wheelchair! Ashaun’s medical struggles have qualified him for Make-A-Wish. 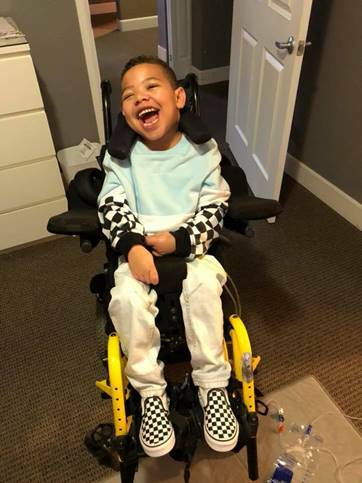 Ashaun’s wish is to have a handicapped accessible park built so that he can play with his friends (typical peers as well as those with special needs) and go fast! Thank you for helping make Ashaun’s wish come true for not only himself but for all of the children in our community!